One year ago, apartment industry analysts were preparing for a year marked by corrections, backtracking rent growth, and declining occupancy rates. While overall growth in the industry was moderate compared to prior years, the cycle persisted as 2016 marked the seventh year of expansion. Less than a handful of markets closed the year on shaky ground, and even in those areas, strong fundamentals persisted in certain asset classes and submarkets. Construction boomed and judging by what’s in the pipeline, the peak of new deliveries may not yet have occurred. 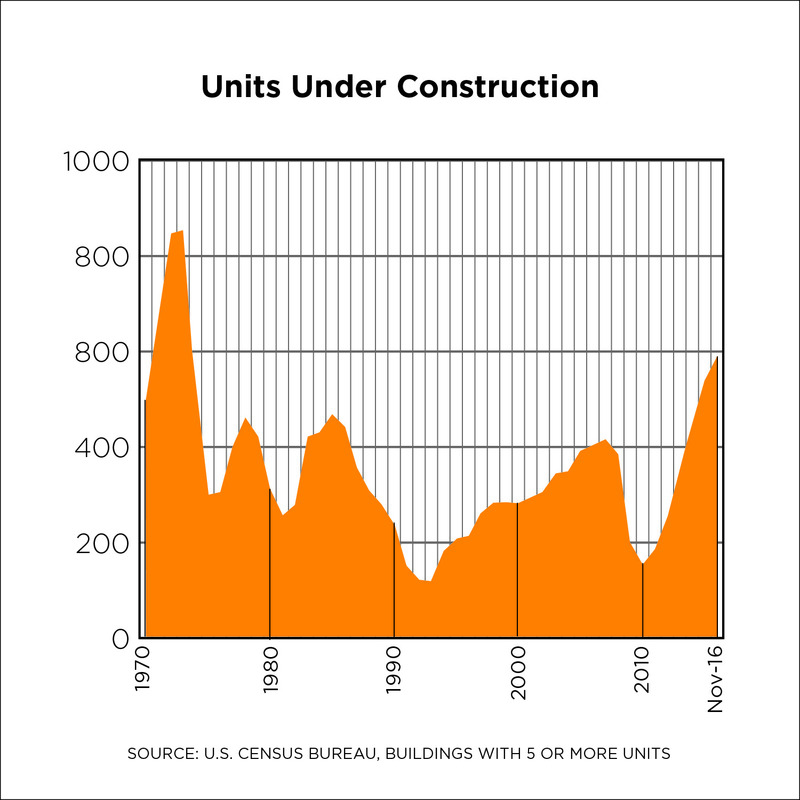 In fact, over the past several months, units under construction have been hitting seasonally adjusted annual levels which have not been seen since the early 1970s, that is, in the 600,000-unit range. Completions for institutional-grade properties neared 290,000 units, according to RealPage, Inc. Absorption, the net change in occupied apartments, exceeded new supply at 329,000 units, a 24 percent increase from 2015. 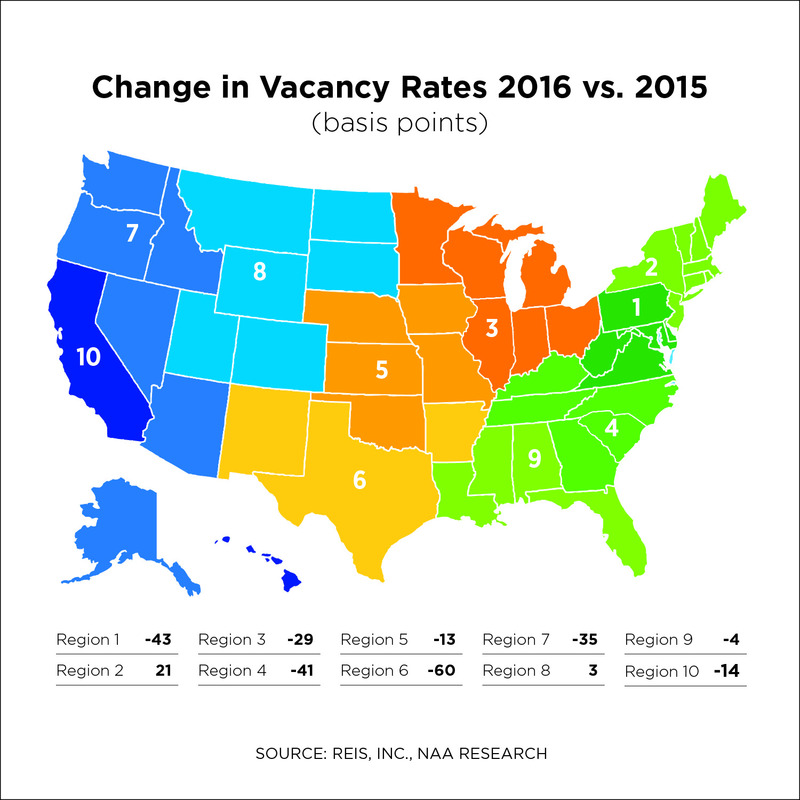 Apartment vacancy rates fell to 4.1 percent, a 20-basis point decrease from the end of 2015, as reported by REIS, Inc. While that may sound insignificant, it’s impressive when accounting for the amount of new supply. Markets experiencing the greatest declines in vacancy (more than 150 basis points) were Charleston, Memphis and Little Rock. Only one market sat at the opposite end of the spectrum: Charlotte, which took a 150-basis point hit to its vacancy rate, thanks to an influx of new supply. Positive absorption and rental growth kept this market in healthy territory, however. All major real estate data firms showed moderating rent growth, with Axiometrics reporting 2.3 percent on a national basis, half the level of 2015. Large markets like New York, San Francisco and Houston, which obviously weigh more heavily in national calculations, experienced declines in average rents, thus causing a drag on national figures. An oversupply of amenity-rich, high-end apartments was the culprit for rent compression in New York and San Francisco, while Houston endured the double whammy of too much supply and oil industry woes. Apartments are the only commercial real estate sector on track to beat last year’s volume levels, according to data from Real Capital Analytics. Through November, closed transactions topped $134 billion, up three percent from the same period last year. This compares to double-digit declines in transaction volumes for development sites, industrial, hotel and retail properties. Foreign investment was down by 36 percent, but remained well above prior years’ levels. Domestic institutional and private equity fund activity more than made up for the cross-border shortfall. 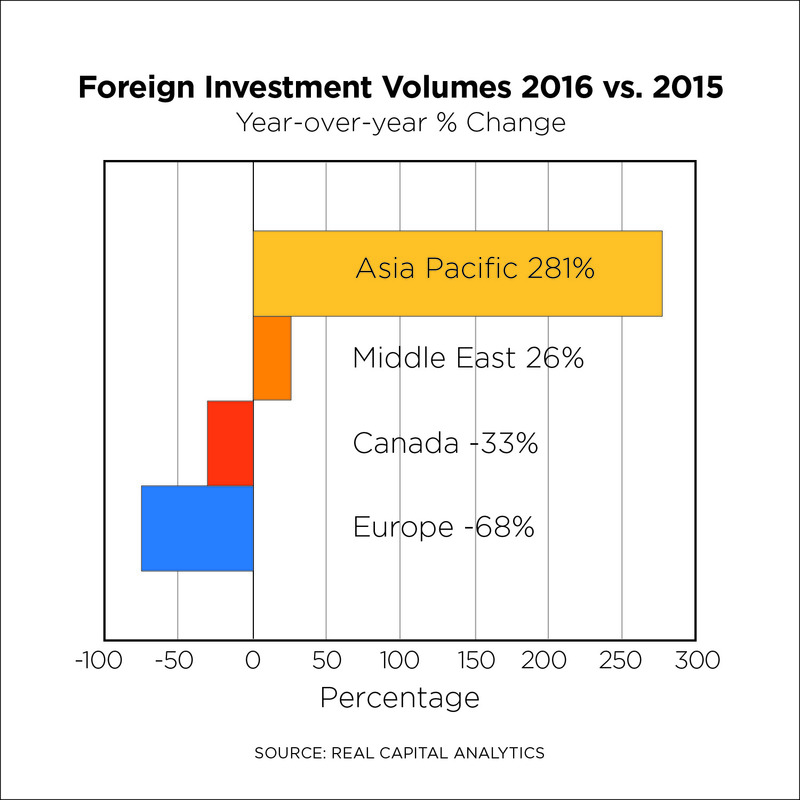 Although Canada still comprised the largest proportion of foreign capital entering the U.S. apartment market, year-over-year volume growth was greatest among Asia Pacific investors. After all but abandoning the East Coast last year, a wide range of markets were favored by Asian buyers in 2016, from the suburbs of New York City, to both large and small markets throughout Florida and the Carolinas. The national economic picture at the end of 2016 was one of clear advancement. The new administration had already inherited a healthy economy by several measures. This is the longest period of job growth ever recorded. Wage growth is trending upwards, and thanks to an extended period of full employment, is expected to continue rising. Third quarter GDP growth was over 3 percent for the first-time in two years. The U.S. dollar strengthened to 13-year highs. 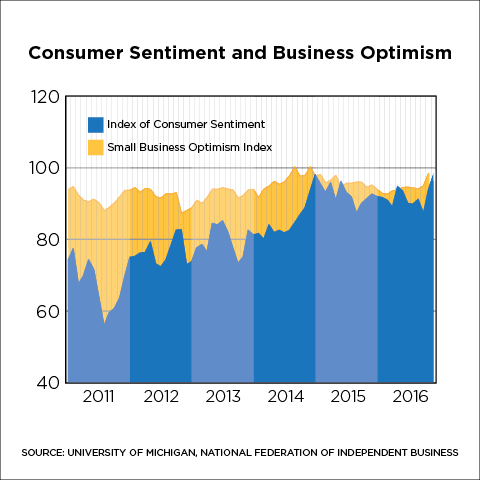 Post-election, the promise of fiscal stimulus, tax reforms, and regulatory retrenchment spurred the stock market, long-term interest rates, as well as consumer and business confidence. There are several indications that the apartment market is in for year eight of the cycle in 2017. The recently released AFIRE (Association of Foreign Investors in Real Estate) survey revealed that 60 percent of its members rank the U.S. as number one for providing the most stable and secure real estate investments. Out of five property types, multifamily was the second-most favored after industrial. Oversupply remains a real concern, but both lenders and developers are being more selective, and doing their homework before taking on projects. The feverish demand generated by population growth, job growth, immigration, demographic forces, and an increased preference for apartment living across generations may swell further as rising mortgage interest rates give pause to potential homeowners.